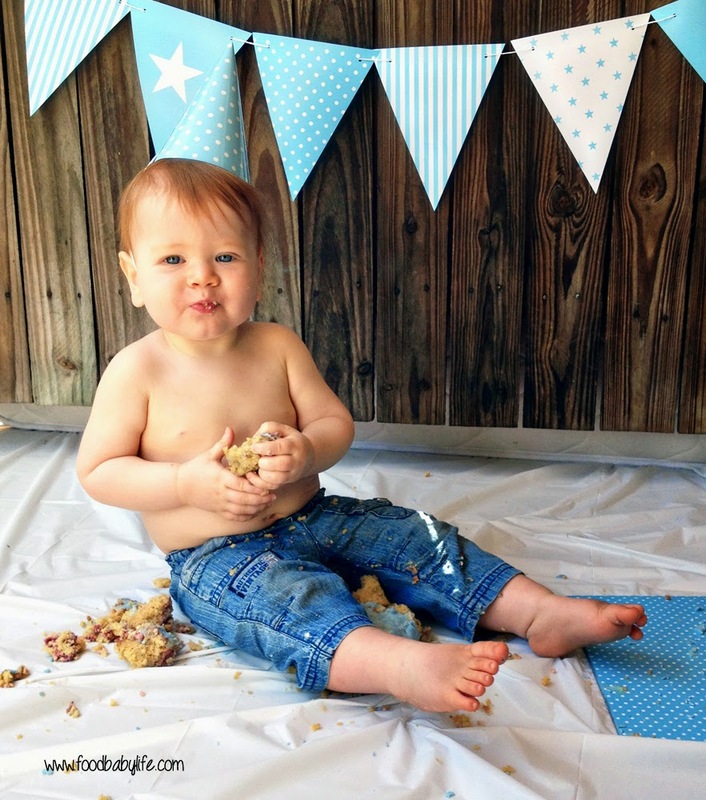 My Wholefood Family Essentials: Noah's 1st Birthday Smash! A big happy birthday to my beautiful Noah!! He turned 1 on Tuesday and is the sweetest little boy. Sigh. Why do children have to grow up so quickly?! I've made a concerted effort this year to do some special things for Noah, partly just because I wanted to and partly because I didn't want him to look back at photos and feel like he missed out! He is the third of 3 boys after all. So for the past year I have been taking a photo of him every week in the same spot and lying on the same little blue striped blanket. It got harder and harder as the year went on to keep him on that blanket but we now have 52 lovely little photos that show his progression from teeny tiny baby to big, solid 1 year old. I also decided to do a cake smash for him (something I never did for the other 2). The only thing was his dairy intolerance (or allergy, we're not sure which yet), which made choosing a cake and icing recipe quite tricky. Luckily a grain and dairy free smash cake popped up in my facebook feed one day. Perfect! I thought I had planned well but we still had a few hiccups such as my camera dying after only a few photos despite being fully charged, the sun shining under the fence more than expected so we had to hunt around for something to block it and then then the actual smash being far less messy than anticipated! Seriously he didn't even need a bath just a good wipe down. 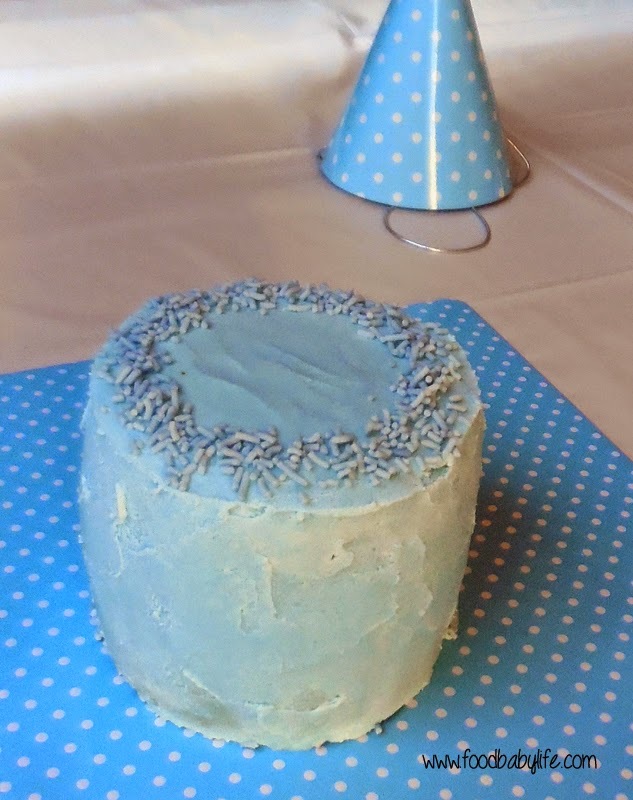 Without a real buttercream there just wasn't as much to smear around. Still, he had an absolute ball! Lots of cake eaten and squished in chubby fists and sat on. So, so cute and lots of fun for all of us to watch. Bottom line even if your little one has allergies a smash cake is still possible! Preheat oven to 180 degrees Celsius. Grease and line 2 x 4 inch cake pans with parchment paper (mine were spring form pans which made for very easy removal of the cakes). In a small bowl, sift all the dry ingredients together and set aside. Then separate 2 of the eggs (yolks from the whites), setting the whites aside. In a large bowl whisk together the 3 whole eggs, two egg yolks, coconut oil, honey, vanilla and lemon juice until they are well combined. Then whisk in the flour mixture till completely smooth, with no lumps. In another bowl beat the egg whites till soft peaks form (looks like softly whipped cream). Gently fold the egg-whites into the batter till theres is only a few streaks of whites visible. Pour half the batter into the prepared cake pans and bake 20-25 minutes or until the tops springs back when lightly pressed (mine took 30 minutes and one was ready before the other, perhaps had slightly more mixture in that pan). Allow the cake to cool for 5-10 minutes, then carefully remove from the pan and cool completely. I used a few tablespoons of my homemade roasted strawberry chia seed jam. Place the first 4 ingredients into the mixing bowl and process on speed 9 for 20 seconds. Scrape down the bowl and repeat. If the coconut butter is not soft and fluffy, add a dash of water and continue (I needed 4 tablespoons of water to get the right consistency). Add the food colouring little and little, processing in between until you get the desired colour. Use immediately. Store the covered cake in the fridge but remove it at least 1 hour before serving to allow it to soften. Place into the mixing bowl and process 3 minutes / 37 degrees / speed 8. That's it! Pour into a jar and store at room temperature. It will be liquid but will harden as it cools.